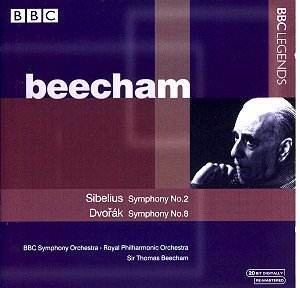 Sensational, thrilling, incandescent: these words put you in touch with this live Beecham version of Sibelius 2 and the Dvoř�k races not far behind. London in December 1954 must have been a haven for chest infections and the common cold. Beecham�s incandescent live concert version of the Sibelius Second Symphony is troubled with a dusting of coughs and throat clearings. Yet it hardly matters. Perversely it enhances the experience of the music - bringing you into close proximity to the experience of this concert. You should be aware that at various points you can hear Beecham hoarsely shouting exhortation to his forces (something he does not do in the Dvoř�k 8). How does it compare with other Beecham recordings of No. 2? My reference point is the Biddulph CD WHL055 . That studio version is good of its kind but it lacks the dangerously volatile spontaneity of this version. The 1954 mono sound is I suppose of good FM radio broadcast quality of that era. There is a hint of congestion from fortissimo upwards. But you know what? It doesn�t matter a whit. The grandeur, atmosphere and sonority of this reading is all the listener will register. The brass benches assert themselves with a chesty magnificence with the trumpets raucously piercing. The strings glisten rather than glow. If you compare the sound of Ormandy�s Philadelphia violins in his 1950s recording of the Fifth Symphony you will notice a sultry Hollywood opulence (in fact very effective) where Beecham�s 1954 BBC violins are vibrant and bright. If you must have a more modern stereo version then try to track down Barbirolli�s 1960s recording with the RPO on Chesky. The most recent Berglund (Chamber Orchestra of Europe, Finlandia) is also excellent as the Szell/Cleveland version (live in Tokyo in 1970), the Oramo/CBSO/Erato and not to forget Ormandy�s version on Sony Classics. The main interest focuses on this Desert Island version of the Sibelius. That said, Beecham�s Dvoř�k 8 is spirited; in fact fiery. The timbre and guttural abrasion of the brass invoke the best traditions of Northern England brass band playing. As for the conductor, Beecham in old age has neither slowed down nor lost his grip. This impetuously determined version is vibrant and pointedly lilting though lacking the outright ideal fluency you would expect in the allegretto grazioso (tr. 7). There is lovingly distinguished work by the great names in the RPO: Raymond Cohen (leader); Jack Brymer and Walter Lear (clarinet), Gwydion Brooke (bassoon - Brooke�s father Josef Holbrooke had written a saxophone concerto for Walter Lear), Alan Civil (horn), Geoffrey Gilbert (flute - driven close to demented in the finale at 2.20 when the wheels almost come off), Lewis Pocock (timps), Philip Jones (trumpet - later the founder and leader of the PJBE), Roy Copestake (trumpet), Terence MacDonagh (oboe) and Leonard Brain (cor anglais). The only technical blemish for me is a moment in the adagio (tr. 6) where the recording level is pulled back - presumably a BBC engineer nervous of overload. For some this will not replace the Talich and Sejna versions, nor those by Rowicki and Kubelik. However it is an glorious alternate version and outstandingly enjoyable. There are coughs and sneezes in the Dvoř�k but again these are of little consequence in the face of such an excitingly flighted almost Tchaikovskian interpretation. This is the second time this pairing has appeared. About fifteen years ago it appeared as part of the EMI Beecham Edition on a DMM pressing LP EG763399-4 and on CD as CDM7 63399-2. For years that version has been a much sought-after deletion commanding premium prices. As for the original black disc issues, the Dvoř�k was released as ALP 2003 and the Sibelius as ALP1947. Interestingly HMV had not rushed to release them: they were issued in 1962 and 1963 presumably as a rather tardy tribute to Beecham who had died on 8 March 1961. This version of Sibelius 2 was reissued in the 1970s by World Record Club on WRC ST 1085 and it was that LP that I managed to pick up for �1.50 in Plymouth Market. The already irresistible virtues of this disc are topped off by Graham Melville-Mason�s liner note. His writings already adorn the Sony Beecham series. Companies cannot go wrong in commissioning notes from him. Record of the Month and certainly in my list for Recording of the Year.